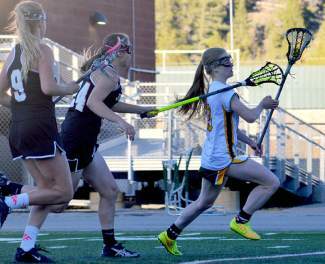 Summit junior Kenady Nevicosi trades fives with Grand Junction players after a girl's varisty lacrosse game at home on May 3. 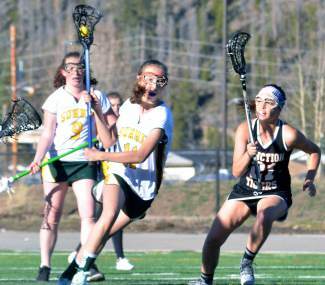 The Tigers lost, 7-10, despite a four-goal game from the quick and confident attacker. 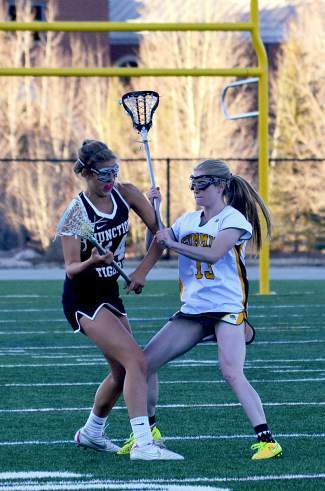 Summit attacker Kenady Nevicosi tries to rattle a Grand Junction player during the second half of a girl's varsity lacrosse game at home on May 3. Nevicosi lead the home team with four goals en route to a 7-10 loss. 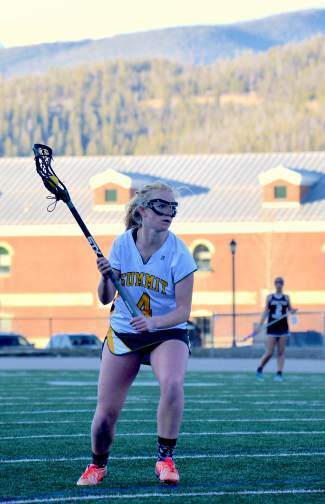 Summit senior Elle Scott-Williams searches for an open teammate at the final home soccer game of the girl's lacrosse season against Grand Junction on May 3. The Tigers lost at home, 7-10. 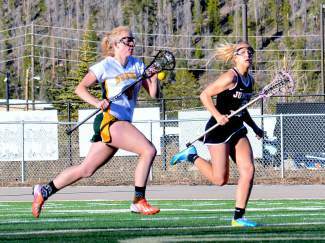 Summit junior Lillian Walker weaves through Grand Junction players during the first half of a girl's varsity lacrosse game at home on May 3. The Tigers lost, 7-10. Summit's Maddy Remias and a Grand Junction attacker collide during the first half of a girl's varsity lacrosse game at home on May 3. The Tigers lost, 7-10. 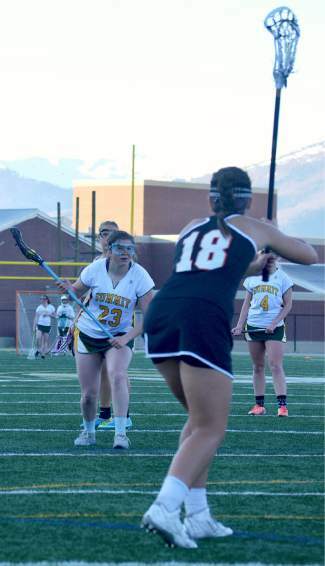 Summit's Mackenzie Hart readies for a restart while a Grand Junction player defends during the final few minutes of a girl's varsity lacrosse game on May 3. The TIgers lost at home, 7-10. 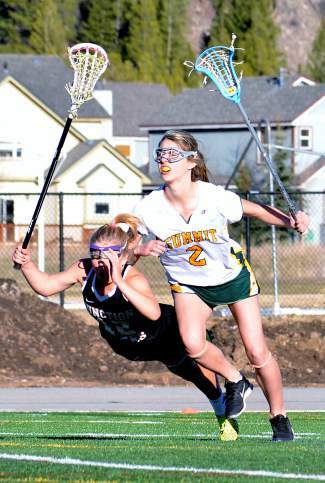 Summit's Lillian Walker and a Grand Junction attacker vie for the ball at a girl's varsity lacrosse game in Frisco on May 3. The Tigers lost, 7-10. 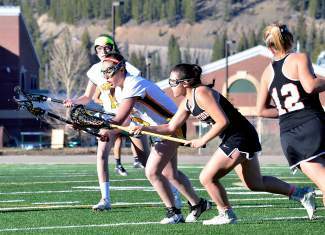 Summit senior Elle Scott-Williams barrels down the field during a girl's varsity lacrosse game against Grand Junction on May 3. The Tigers lost, 7-10. Summit head coach Merri McKissock talks with her varsity squad during halftime of the final home game against Grand Junction on May 3. The Tigers lost, 7-10. Summit junior Kenady Nevicosi blasts past Grand Junction defenders en route to scoring one of four goals during the Lady Tigers 7-10 loss at home on May 3. It wasn’t quite the Senior Night game the Summit girl’s lacrosse team wanted, but it was a showcase this promising program needed. 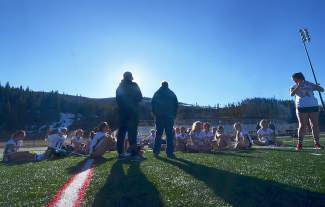 Under the fading rays of Tuesday sun — the game was pushed back to 5:30 p.m. for AP testing — the Lady Tigers took on the other Lady Tigers of Grand Junction for Summit’s final home varsity game of the spring season. 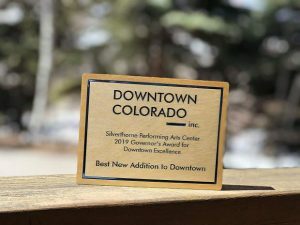 The game started slow in the first half, but things quickly picked up as the two 4A Western Slope foes started trading goals at a rate of one every minute in the second. Unfortunately for the home team, Junction started the half ahead and stayed that way, eventually defeating Summit, 7-10, despite highlight-reel playing from a cadre of juniors. Junction entered the match ranked No. 3 in the league with a 10-2 record overall and 4-2 record in the 4A Slope, behind only undefeated Aspen (7-0 league) and perpetual powerhouse Battle Mountain (9-1 league). On paper, the game seemed like Junction’s to dominate, but the No. 7 ranked Summit squad (3-9 overall, 2-4 league) wasn’t about to roll over and play dead, especially not the graduating seniors playing in their final home game. Senior co-captain Elle Scott-Williams came out with guns blazing. 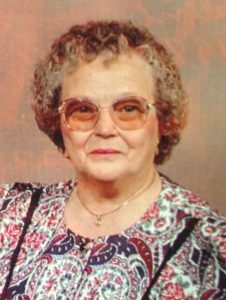 Although she had just one goal, she managed the field like a pro and kept the big, fast Junction line from hogging the ball. 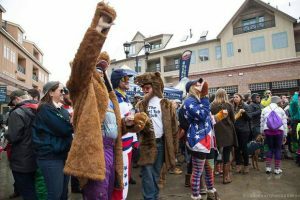 Bad luck followed Summit like a lost dog — the attackers had several would-be goals bang around the posts — but the girls were playing tough in response to Scott-Williams. This helped Summit keep things tight at 1-1 until the final five minutes, when Junction scored back-to-back goals to enter the locker room ahead, 3-1. Tough team or no, Summit stayed neck-and-neck with Junction. 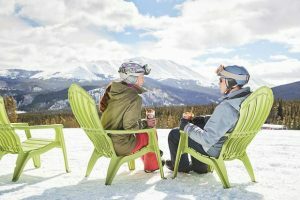 With only four graduating seniors and a whopping 14 juniors ready to fill their shoes, next season promises to be stellar for the Summit girl’s program. The Senior Night fans were treated to a preview of the explosive excitement to come when fast, nimble junior Kenady Nevicosi started tearing through the Junction defense. After the slow-burning first half, Nevicosi & Co. wasted no time scoring with a goal from fellow junior Katelyn Keen less than a minute into the second. Junction responded with two back-to-back nets about five minutes later, bringing the score to 2-5. And that’s when Nevicosi started lighting up the field. Less than 30 seconds after Junction extended the lead, the star attacker gobbled up the ball on a scrum in front of the Junction goalie and slipped it into the corner. She went on to score four goals total — a hat trick, plus one — including an unbelievable run that started deep in her team’s territory, wove past mobs of players at midfield, barreled through the last two defenders and ended with a pinpoint shot to the upper-right. All told, Nevicosi covered about 60 yards en route to that one — a bright spot after lengthy stretch of sloppy, lackadaisical play at midfield helped Junction maintain the lead. Despite ending with a losing record, McKissock is certain her team will return next season ready to dominate the league. 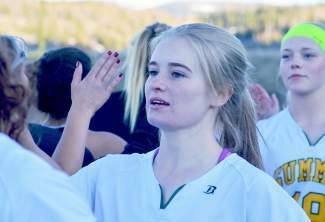 She’ll miss her core group of talented seniors — Scott-Williams recently committed to varsity lacrosse at University of Colorado-Colorado Springs — but she’s confident the massive junior class is a major threat. Summit’s final game is an away match on May 6 at Pine Creek High School in Colorado Springs.